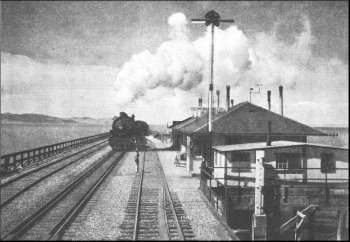 Did you know that there was once a town in the middle of the Great Salt Lake? Well, not a town really. A hamlet named Midlake. The most unusual hamlet that Utah has ever produced. Sitting on a wood platform right in the middle of the lake, its only “street”was the transcontinental railroad. Built from 1902 to 1904, engineers constructed a trestle supported by 38,256 wooden pilings. Three decades before, the two crews working in opposite directions … on the transcontinental railroad … had to complete a winding track through the mountains north of the lake. The railroad decided that running a track straight across the lake would save a lot of time and money. This trestle … known as the Lucin-Ogden cutoff … was an engineering marvel at the time. It saved 44 miles and more than 21 hours of travel time. 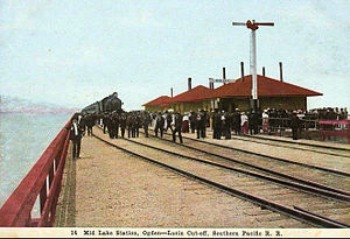 Since trains crossed the lake constantly and at all hours, railroad workers were needed around the clock to maintain the tracks and the trestle. So the town of Midlake was built … on a platform 80 feet long by 40 feet wide … suspended 15 feet above the lake. Originally built as one of several temporary camps, Camp 23 remained after the trestle was completed. The town in the middle of the Great Salt Lake had a store, a telegraph office, and a row of houses. The population even reached 30 at one point. All of them men except for three telegraphers later on. They pretty much did nothing but eat, sleep, and work. No booze allowed. Mail, groceries, and other needed supplies were brought in by rail … of course … every day. The train order office was closed in April 1945. By August, the workers and buildings had been relocated to Promontory Point. The trestle was replaced by a rock-and-earthen causeway in 1959. That causeway is not exactly the same one that exists today. Beginning in 1957, the Union Pacific Railroad started laying down a new earthen causeway parallel to the old one. And then they removed the old one. The new causeway allows very little water to flow between the two sections so the salinity has become much higher in the northern section. Most of the fresh water flowing into the lake does so in the southern section. This has actually caused a difference in color tone for the two sections of the Great Salt Lake. The north side usually has a distinct reddish tint. While the south side looks more turquoise.